In electric mixer bowl, combine the Mashed Potatoes and Eggs; using the paddle beater beat at medium speed until the Eggs and Potatoes are thoroughly combined. Add 2 cups of the Flour and run at low speed until the Flour is mixed into the Potato Mixture. Add the Salt and then switch to the dough hook; continue adding the Flour, one cup at a time, until you have a soft Dough. Allow the dough to knead for about 5 minutes to develop the gluten. Gather the Dough together into a ball; sprinkle lightly with Flour being sure to cover all the surfaces. Leave the Dough in the bowl, and cover with plastic wrap. Put in a warm place to rise until doubled in bulk; punch the Dough down and cover; let rise a second time until doubled. Punch the Dough down and turn out onto a lightly floured pastry board. Divide into 3 pieces; roll each piece into a long rope and then braid the 3 pieces together. Place on a baking sheet that has been greased and sprinkled with Cornmeal. Cover with a clean dish towel and allow to rise until doubled in bulk. Bake in a 375 degree oven until a golden brown; the bottom should sound hollow when tapped. Make sure the bottom of the bread is also browned. Place on a cooling rack and allow to cool before slicing and serving. 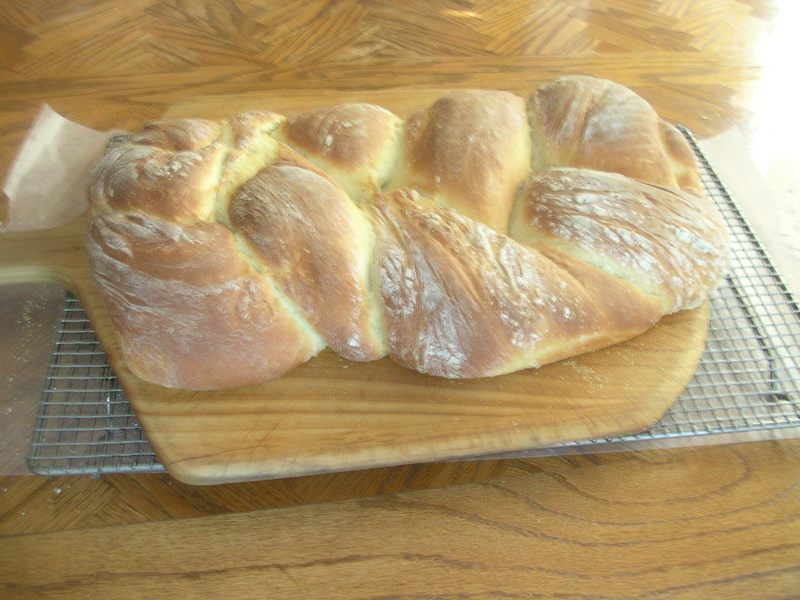 Note: The finished bread will be soft so use care when handling so as not to break it. Traditional Method: If you do not have an electric mixer, prepare the dough by hand, following the same procedure. Mix the Dough with a wooden spoon and knead it by hand on a floured pastry board. The hand kneading process will take up to 10 minutes.